It is simple to look at the NECC the “manufacturer” of the products. Initially the 3 batches of methylprednisolone acetate were implicated, but now all of their injectable drugs are under suspicion. Their web site is down and they are no longer doing business. So chances are they do not have close to enough assets or insurance to to compensate all of the victims. Already commentators have discussed potential responsibility on the part of the Clinic and medical facilities that purchased the drug . In fact, in New Jersey a lawsuit has included healthcare providers. Some of the issues are what steps did health care providers take to see that the steroid was safe for use. 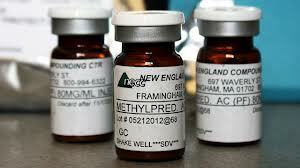 There were red flags out there as NECC had already been warned by the FDA not to engage in certain practices. It is evident that the New England Compounding Company was making this steroid in bulk and not in response to individual prescriptions which was against Massachsetts law. It’s hard to imagine that those purchasing the drug did not know that it was not being provided per patient prescription. Lou Diorio, a consultant to compounding pharmacies was quoted as saying it’s harder to keep everything sterile when working with large amounts. And he gave many ways the bulk manufacture could contribute to allowing the fungus. (Source: article by Mike Stobbe) The steriod comes in a powder and a liquid is introduced creating a liquid mixture. The two types of fungus Aspergillus and Exserohilum are common . However no one has confirmed the source of the fungus. Rueters news service repoted that NECC and Ameridose and Alaunus are owned by Gregoroy Conigliaro and brother in law Barry Cadden. Regulators are looking at “goverance issues”. As an attorney I would be looking at mutual control and de facto partnership issues. No one has identified the company that supplied the powdered steroid. No one has said whether other intermediary distributors are involved. But they could certainly be players in this critical outbreak and the lawsuits to follow. Anthony Castelli attorney represents persons that are injured or had a loved one die as a result of the negligence of others. He has authored two books and coauthored the best seller Wolf in Sheep’s’Clothing. He has tried over 25 civil injury claims.